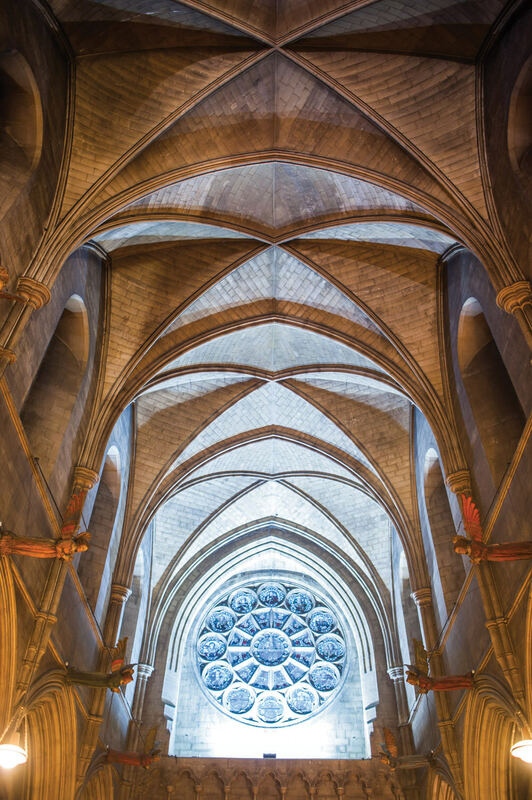 These notes will guide visitors (clockwise) around some of the outstanding features of this extraordinary achievement of the later Gothic Revival - view the plan diagram shown here to get a sense of the areas. 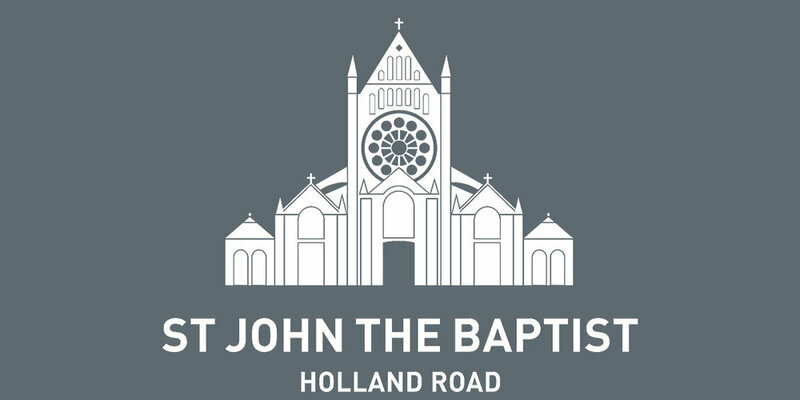 We also have a Heritage Trail for families visiting St John’s. You can download it here or pick up a copy in the church. 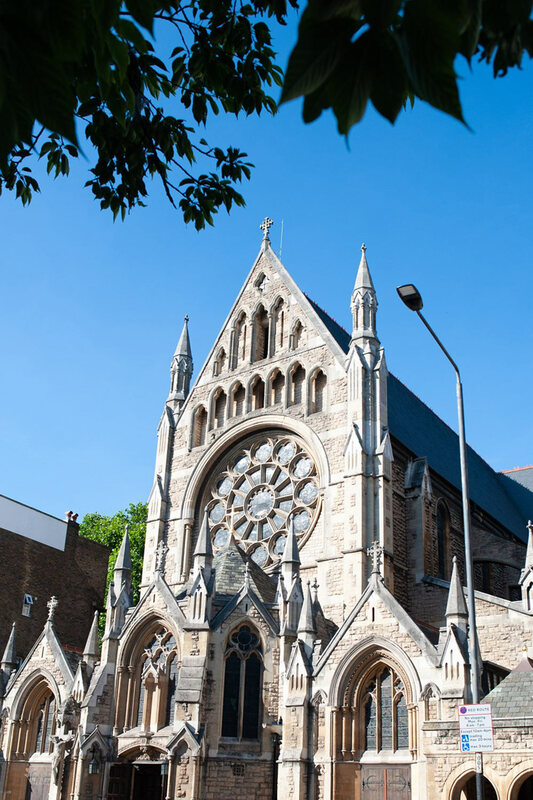 It is a great shame that the exterior is so hard to view adequately, but it is worth crossing the road via the nearby traffic lights to admire the flying buttresses and the west front. The original intention was for a tower and spire but the ground proved too soft for this. Brooks died in 1901 and his associate J.S. Adkins completed the west front in 1910. The church was built of Ancaster rag rubble with Bath stone copings. The interior is in dressed Bath stone. This was built to Adkins’ designs in 1910, enclosing the original open porch. The large rose window above the narthex is by Percy Bacon & Bros and depicts Our Lady with the Christ-child surrounded by Biblical figures. It was paid for by a single generous donation. Very fine statues of the wise and foolish virgins flank the impressive arch into the main body of the church. They were carved by J.E. Taylerson in 1911 and cost £5 each. The wooden doors on the north lead to the Chapel of SS Michael & George which is furnished as a First World War memorial. 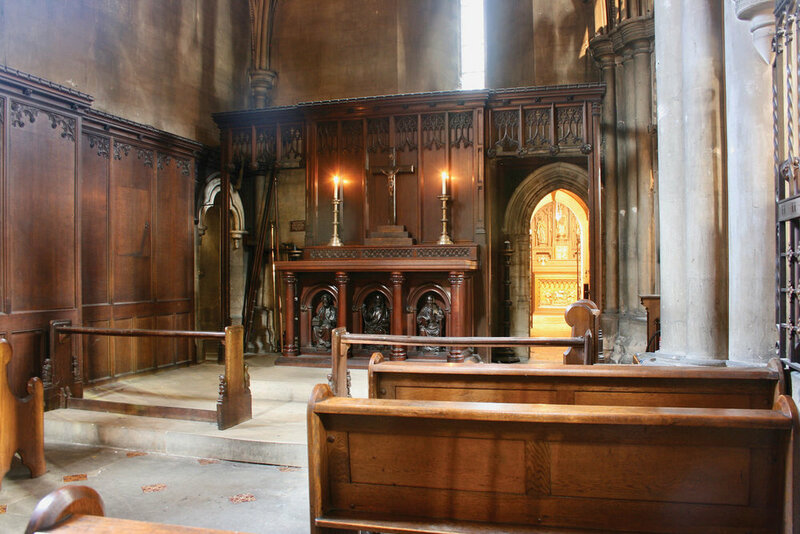 The wooden reredos is a copy of the rood on the stone chancel screen. 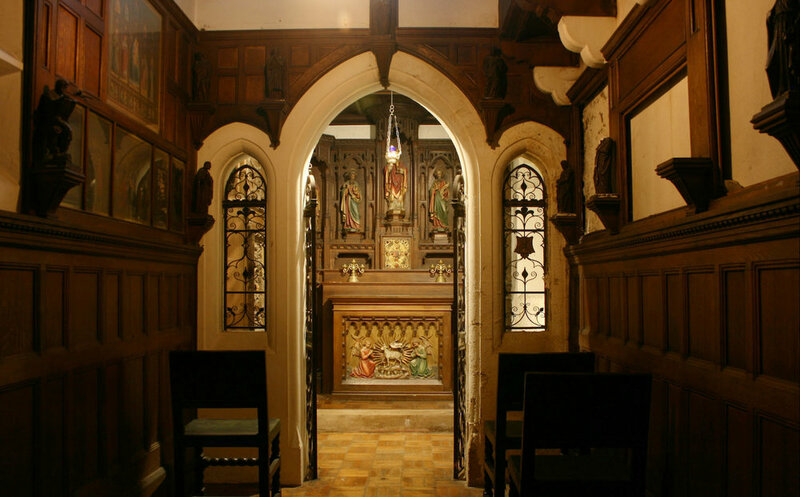 The room to the south, originally a chapel dedicated to St Saviour, once served as the parish scout troop room. It is now a general function room with catering and lavatory facilities for church and community use. The elaborate font in polished Devon marble, built to J.S. Adkins’ designs in 1910, was paid for by the children of the parish. Adkins placed the font in the centre of the narthex, just inside the west doors. 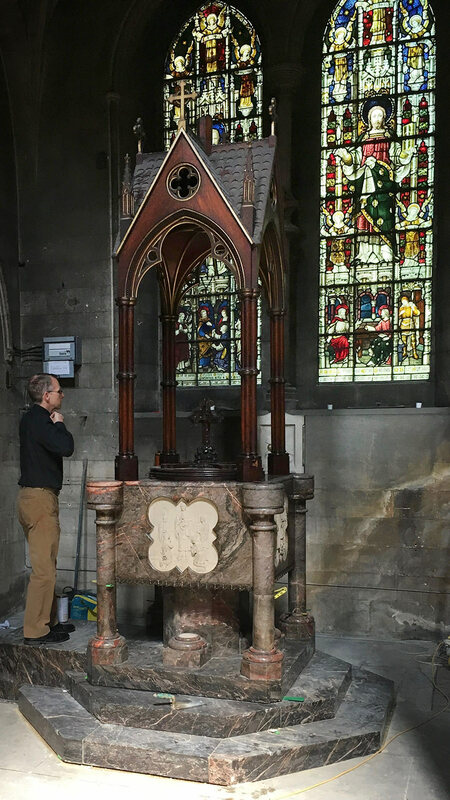 In 2018 the font was moved to the west end of the north aisle, the position James Brooks envisaged in his original design for St John’s. The panels represent the four Sacraments relating especially to young people: Baptism, Penance, Confirmation, Holy Communion. The Shrine of the Calvary: all the shrines in St John’s are either of carved oak or teak (no cheap plaster!). This one is in oak and dates from c1920. The Stations of the Cross in gold and coloured mosaic are by Adkins 1912-1915 and cost the then large sum of £50 each. The pews are also of oak, the decorative roundels turned by the church’s scout troop in the 1930s. All the stained glass is of top quality, much by Clayton & Bell (there is a Kempe window in the south aisle). As with all the imagery in the church, the stained glass follows a carefully devised iconographic programme. Altar by Brooks with teak figures. The altar rails are a quirky example of 1920s neo-medievalism. To the left is access to the vestries etc. This is found just to the east of the chapel of SS Peter and Paul. It was built in 1912 by Adkins for the reservation of the Blessed Sacrament (now reserved on the high altar). The aumbry door depicting the risen Christ is mediaeval. The existence of the chapel was kept secret for many years. The Anglican Church did not allow the reserving of the blessed sacrament, considering it too sympathetic to Rome. 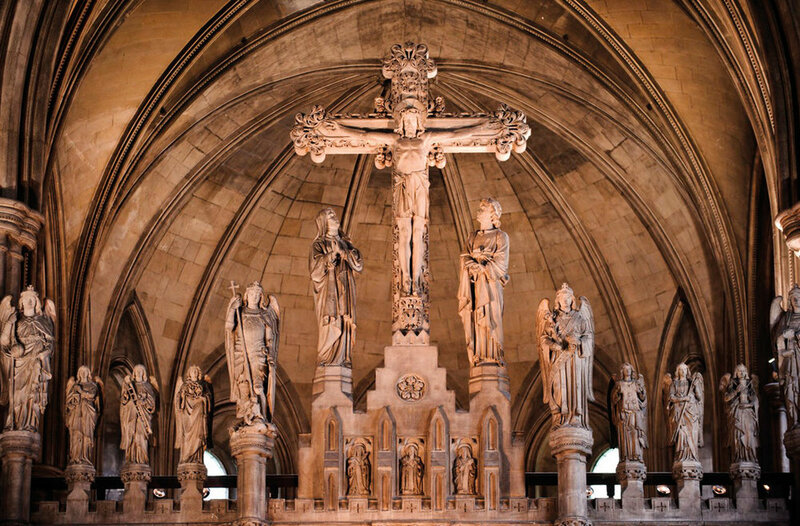 The stone screens across the north and south aisles and chancel form a single iconographic programme illustrating the spread of the Catholic Church throughout the world and were constructed between 1894 and 1900. The many sculptures in Corsham stone are by J.E. Taylerson. The north screen features an angel with trumpet proclaiming the Gospel to all nations, accompanied by mission saints of the British Isles. The south screen represents the Catholic faith, accompanied by mission saints of Europe. 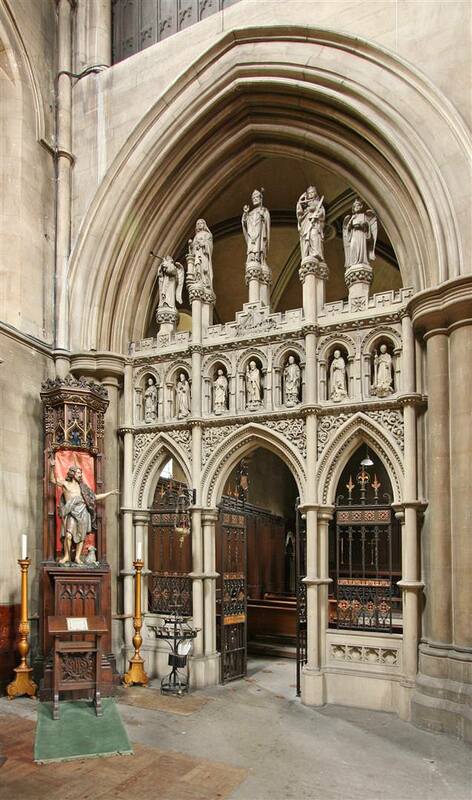 The chancel screen features the rood with its attendant figures of Our Lady and St John. It represents both the Passion and the Tree of Life, accompanied by the four Archangels. Over the chancel arch are two angels with thuribles. 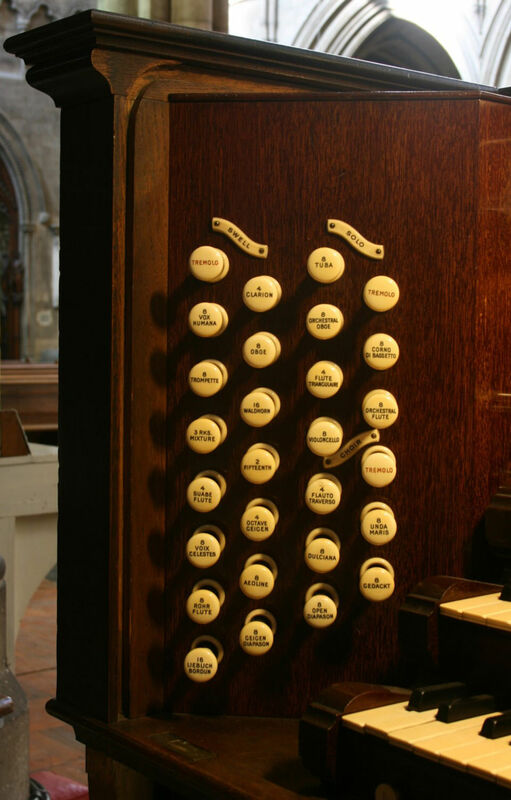 Approximately the size of the one in Truro Cathedral, and one of the most unusual church organs in London, this versatile instrument enjoys a sumptuous acoustic. Its pipework fills the north chancel gallery. Built by the local German immigrant organ builder August Gern, it was opened in 1897 by Sir Walter Parrett of St George’s Chapel Windsor before an audience of 770. That four-manual organ, with some additions, was rebuilt by Henry Willis III in 1928, and remains intact to this day. The new console, built at that time, was moved from the organ loft, with exactly the same configuration, to the south transept floor by N.P. Mander in 1955. It is an unusually resplendent and full-toned instrument for a parish church. An increasingly necessary rebuild will be carried out when funds are available. In 2014 the church obtained on loan from B.C. Shepherd & Sons a one-manual chamber organ c1850. It is regularly in use. In 2015 the church was again fortunate enough to acquire, on inspired loan from Joy Puritz of St George’s Church Campden Hill, an Ibach grand piano chosen by Richard Strauss for Joy’s grandmother, the international soprano, Elizabeth Schumann. The reredos (the ornamental screen covering the east wall behind the high altar) was completed in 1895. It features painted panels representing the Heavenly Jerusalem of “all nations and kindreds and peoples and tongues standing before the lamb”. This was rebuilt and enlarged with the flanking arcading in 1902 by Adkins. The figure on the crucifix is c15th Spanish. Other fittings include: marble pavement 1902, altar rails 1897, high altar 1895 and the Bishop’s throne by Adkins of 1916. Memorial plaques to the left and right record clergy, officers of the church, and parishioners. 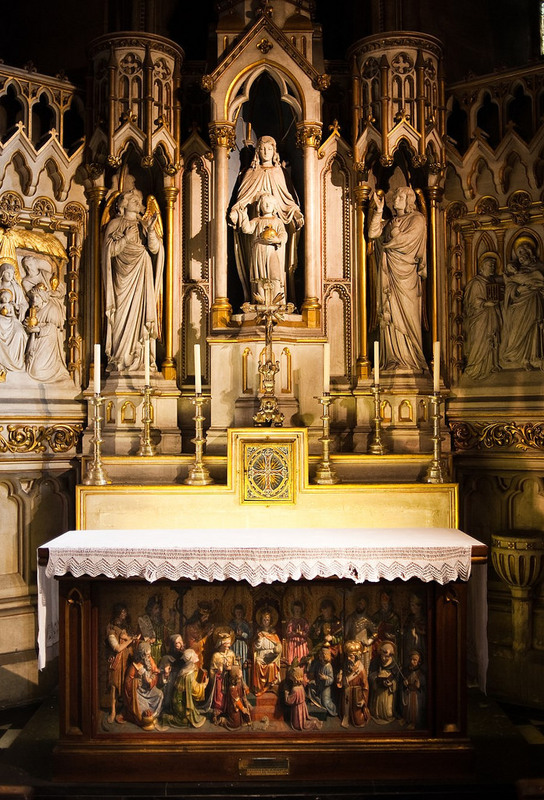 Following the fire around the high altar in 2017, the reredos was extensively restored, returning it to a standard not witnessed in living memory. 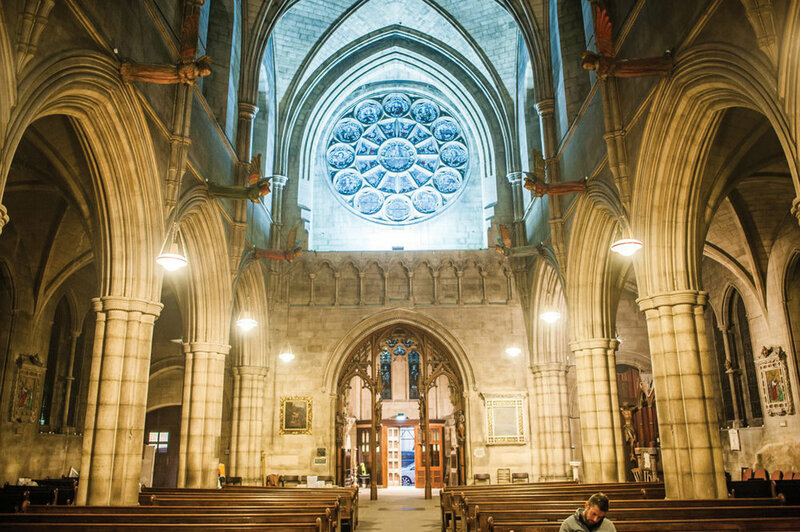 In 1872 tenders were invited for the construction of the chancel - the section stretching from the sanctuary to the Chancel Screen in the centre of the church. It was to be raised four steps above the nave floor. The ornate chancel gates provided the finishing touch in 1894. They were designed by James Brooks and dedicated to the memory of Mary Spencer, wife of the vicar. 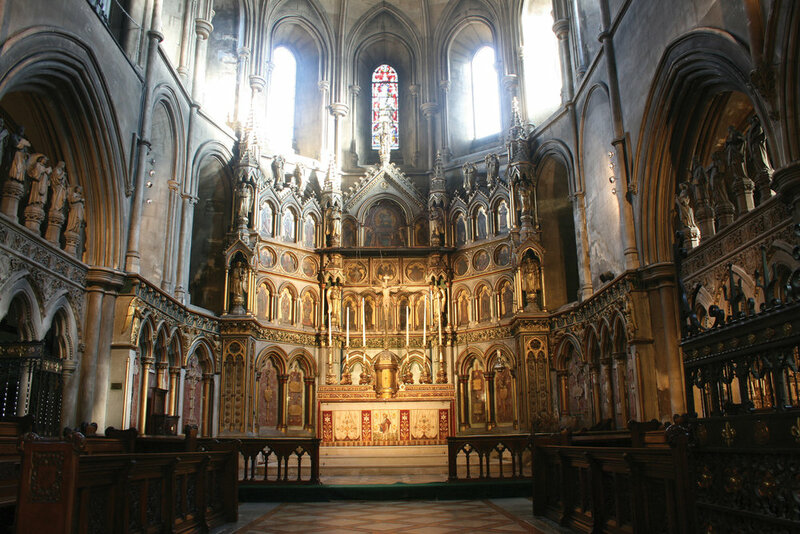 The vicar’s daughter, Miss Spencer, carved the fine choir stalls with the text of the Te Deum, an early Christian hymn whose title comes from its opening words: Te Deum Laudamus; We praise Thee O God. 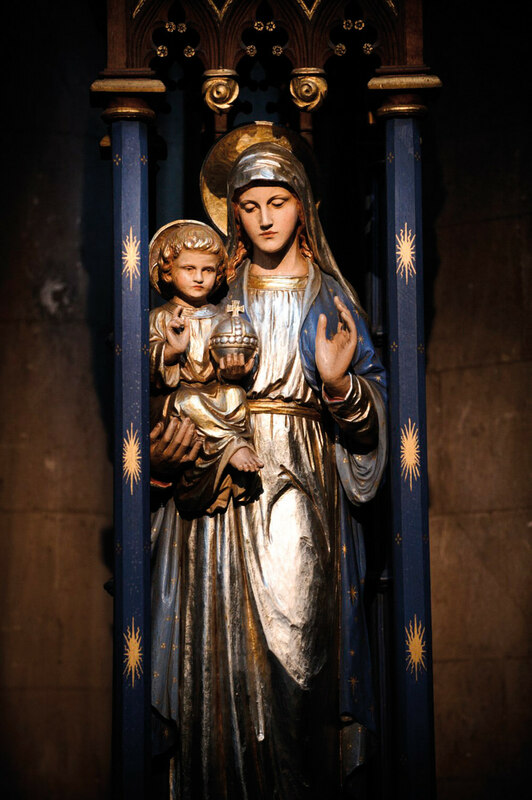 The reredos is by Adkins, 1907, representing scenes from the life of Our Lady. The female personification of the Church to the right holds a model of St John’s under her arm. A Mr Clarke who was responsible for the pulpit figures also carved this. The altar of 1905 contains a neo-mediaeval tableau by Grosse and Sons. The subject matter is the history of the Church: pre-Incarnation to the left and post-Incarnation to the right. The present-day church is represented by the bishop on the extreme right modelled on the then Bishop of London, Arthur Winnington-Ingram. Some 80 memorial and thanksgiving plaques on the south wall record the names of parishioners. The vaulting in the crossing was originally to be a complex hexagonal lantern surmounted by a flèche on the roof. The stone pulpit, to the design of Brooks (1902) and featuring figures of St. John the Baptist and the four Doctors of the church, was supplied by Martyn & Co of Cheltenham. The stone ambos for Epistle and Gospel, their design and position based on early exemplars in Italy, were also supplied by Martyn & Co. The paschal candlestick is particularly fine in golden marble with onyx banding and inlaid crosses of Egyptian porphyry – Adkins 1910. Along the nave, on both sides, eight wooden angels hold the lamps that light the church. They also have a metaphorical role, drawing back the veil between heaven and earth. 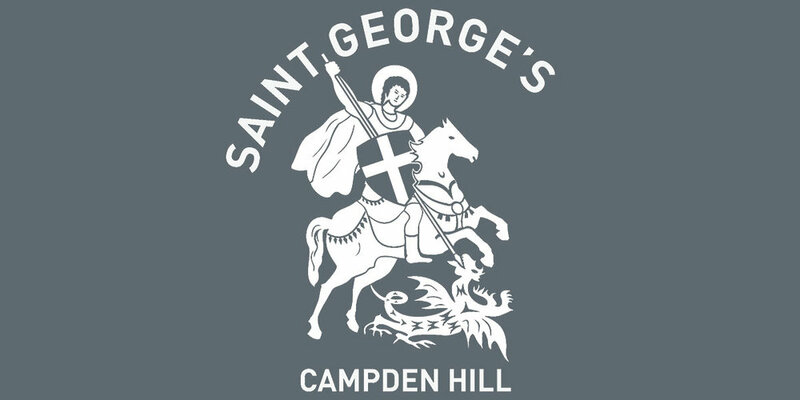 The church has an excellent collection of heavily embroidered banners, vestments and altar sets, all characteristic in design and execution of the late 19th and early 20th centuries. To make sure the disapproving Anglican Church did not confiscate their vestments, the early vicars of St John’s insisted they were personal possessions. They may be seen on special request.